I, like many others I’m sure, was really excited when I heard that Dan Brown was releasing a new novel. Of course, I was one of the many who had pre-ordered my copy of Inferno. I was especially excited when I learned that it was going to be another Robert Langdon novel. I really enjoy the adventures of Professor Robert Langdon. He is a much more believable character to me than one such as James Bond. I like the quirkiness that Langdon provides, especially with his need to wear his Mickey Mouse watch every day. Langdon’s need to always have his Mickey Mouse watch almost makes me wish I had a quirky little item that I needed to wear or have with me at all times. For me personally, the start of the novel was a little hard to understand as we jump right into what Langdon has been dealing with. The reader, or at least I, started off the novel confused, but of course this ended up making sense as we come to understand more of Langdon’s mental state at the beginning of the novel. The difference in Inferno compared to Brown’s other books involving Langdon is that we the readers are figuring out the mystery surrounding Dante’s Inferno with Langdon instead of feeling like we’re a step behind and having Langdon explain everything to us. Once again though, Professor Langdon does find a female companion to race through the streets of Italy with as he tries to figure out this latest mystery. It seems as though Brown usually finds a Langdon a companion to work through these mysteries so that Langdon is not simply talking out loud to himself as he works through the clues that he comes across. I suppose if that were to happen, readers would not be a character that readers would be able to relate to and instead would merely seem like a crazy person who has the means to run around the world chasing after mysteries. However, I digress. In Inferno, Langdon finds himself wrapped up in a problem that the World Health Organization is somehow involved in and the clues appear to solving the mystery seem to revolve around the words written hundreds of years ago by Dante Alighieri in his work “The Divine Comedy,” an epic poem about heaven, hell and purgatory and Dante’s journey through them. How exactly the World Health Organization and Professor Robert Langdon is another one secrets that Dan Brown explains as the story progresses. We also have the addition of some other secret organization who seems to be working with the man who began the whole series of events. It is through this mystery man and the organization backing his plan that the reader learns there is some sort of plot to bring a correction to the over-population problem the our world faces. What exactly this “correction” is, does not become clear until much later in the novel. But Professor Langdon must race against the clock to try and stop the chaos that would ensue if this plan was allowed to be carried out. Dan Brown’s Inferno is another great mystery novel which combines literature, science and history in an exciting way. After reading Inferno, I have become determined to read Dante’s Inferno for myself so that I have a better understanding of some of the references in Dan Brown’s novel. 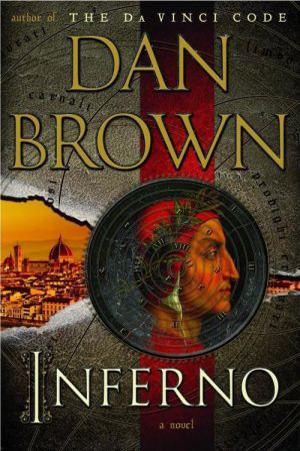 Even though Inferno is a continuation of the “Robert Langdon” novels, it is not necessary for one to have read Angels & Demons, The Da Vinci Code, or The Lost Symbol before reading this book. I personally enjoyed Inferno very much and I think it is a must read for this summer. I love the mix of history with literature with science and the topic of over-population is a current and relevant one that will keep readers and professionals talking. Would the “solution” presented in this novel be one that scientists have talked about? What are the ethical problems that come up when considering this “solution” and would people be willing to make such a sacrifice?